efore the new year begins I wanted to share some of my favorite makes from this year. This has been a crazy year for me and my family. Between starting school and being pregnant my sewing has definitely been pushed to the back burner. I mean you can only sew so many maternity clothes without feeling like you're wasting time and fabric. There are a lot of items I'm really proud of, such as the fact that I made 3 coats this year! My houndstooth coat was my first ever, and the first time I learned how to bag the lining. I used the same technique when I made my Brenna maternity coat, almost 11 months later, and I still love both! Adelle's coat was a lot more complicated. The McCalls pattern was really for a simple sweatshirt jacket with welted pockets and simple buttons, but with all my add ons, such as a fur lined hood, snaps, and toggles. not to mention the awesome iridescent quilted mauve knit for the outside, coupled with the plaid microfleece for the lining you bet your bottom dollar this jacket took on a life of it's own. But I absolutely love how it turned out. And seeing Adelle wear it so proudly makes this one of my favorite makes to date. Another challenge I managed this year was making jeans. I never thought I would even attempt them but the Ginger Jeans pattern is the bomb and I can't wait to be able to wear them again. I also got to make a pair of men's trousers from the same floral fabric and fabric featuring the logo of his donut shop which were worn in a cover shoot for Sauce Magazine. It was a challenge just to sew for someone else, let alone someone in a different city. We shipped the muslin back and forth to get the fit right. After starting school in April my sewing kind of stopped until May when I found out I was pregnant. I did a lot of little instant gratification projects, some that took only minutes, to others that took a few hours but one of my favorite baby makes has to be this bear nightgown I made. It was exactly what I pictured in my mind. 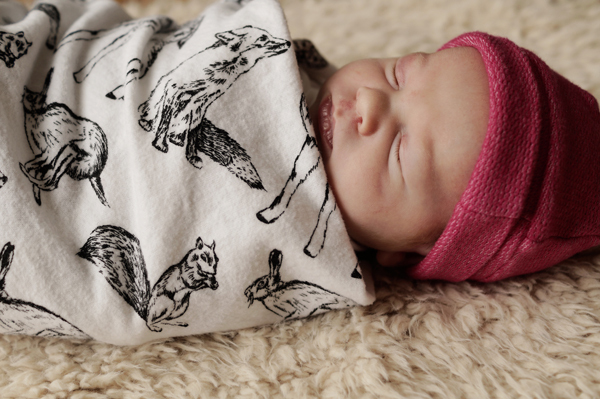 I also love this terry cloth sleeper pattern by Purl Soho and I can't wait for baby girl to wear it! 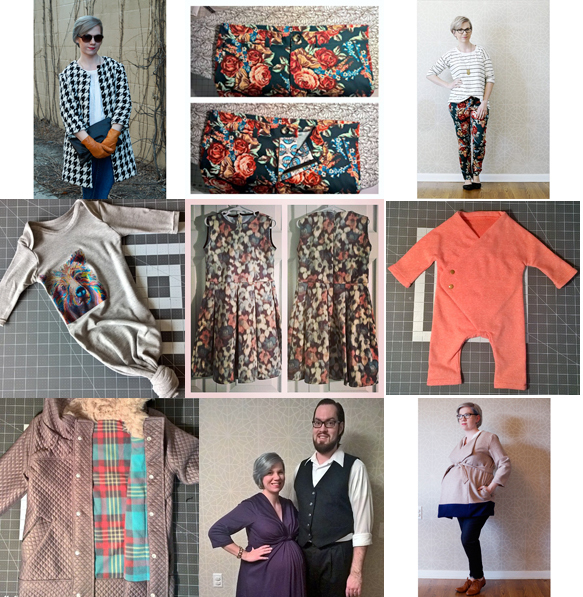 My last two makes include a simple dress for Adelle for school pictures with a water coloresque fabric and a maternity dress I whipped up to wear to my husband's holiday work party. Both were pretty quick, and I got to learn a little fabric manipulation with the maternity dress which was fun. our beautiful little girl, Aria Wynelle, who was born December 19th, 6lbs 15 oz and 19.5" long. We are completely smitten. So as much as this year has had to offer us, I'm really hoping for a simple 2016. I'll be finishing up my last year of school, Adrian will be starting pre-school, and I'm going to enjoy snuggling this girlie as much as I can, while hopefully getting in some sewing. I'm really hoping to be back at Tangible Artiste sharing projects, tutorials and getting to know more sewists. So if you have a blog, or instagram account let me know, I'd love to connect and I could always use more reading material during those late night feedings to keep me awake!